Preheat oven to 350°F. Spray 9-inch deep-dish pie plate with nonstick cooking spray. 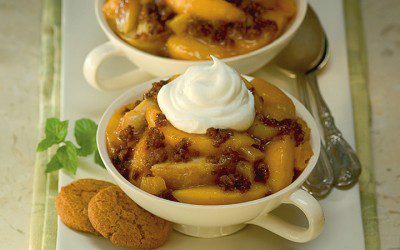 Combine peaches, pears, apricots, 2 tablespoons brown sugar, cornstarch, and vanilla in large bowl; toss to coat evenly. Transfer to prepared pie plate. Combine crushed gingersnaps, remaining 2 tablespoons brown sugar, oil, and cinnamon in small bowl; mix well. Sprinkle evenly over peach mixture. Bake 30 minutes or until bubbly. Cool in pan on wire rack 10 minutes. Serve with whipped cream, if desired. Exchanges per serving: 1/2 Fat, 3 Fruit.